Shortly after my first book was published, I gave a book talk at our local library. Then I gave another talk at another library. And then a third library. Then a Rotary Club called me. A few months later, I found myself the featured speaker at a Shriners dinner. Last month I presented a talk at the National Eagle Center. Birding festivals, book conferences, annual meetings, schools, service organizations–I’ve addressed them all. Wait a minute. I thought I was a writer, not a speaker. Guess what? Book authors get to do both! The fact is, you NEED to do both if you’re going to successfully build your readership and market your writing. That means you should work on your public speaking skills, and the best way to do that is to take every opportunity you find for a speaking engagement. Develop the following five types of speeches, and you’ll be ready for anyone! The Book Talk is the speech that focuses on your book’s content. If it’s nonfiction, you can give a general review of the topic itself, or focus on just one chapter’s point and why it’s important. If it’s fiction, you discuss characters, their relationships, the plot, how you came up with all of it, what you want to accomplish with it. This works best with audiences who have already read your book because they will have questions about what they’ve learned and/or enjoyed from reading it. The Business Talk is about your experience with the publishing business of being an author. The changes we’ve seen in publishing, including the growth of e-books and marketing paradigms, is a topic that appeals to audiences composed of business people or future authors. The Writing Talk is about your own process of writing a book. Do you do research? Conduct interviews? Journal or set word goals? The beauty of a Writing Talk is that it is appropriate for a variety of groups, and depending on the slant you give it for the group you’re addressing, it works equally well as a classroom talk, a keynote address for a gathering of library supporters, an awards speech, a writers conference, a book club… you name it. The Topic Talk is the newest talk in my own arsenal of speeches. Because my books are about nature, I’ve started giving talks about nature education and conservation issues. If it is mentioned in my books, it’s fair game for a talk and a great way to use extra research. 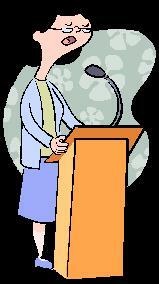 Here is a great resource to help you to continue to develop your public speaking skills. What talks could you present for your book? Do you have any ideas for talks that I have not mentioned? This entry was posted in Encouragement, Marketing and Promotion, Writing and tagged book talks, encouragement, encouragement for writers, Jan Dunlap, marketing, Marketing and Promotion, platform building, promotion, publishing, speaking, Toastmasters, Writer's Life, writing, writing life by jandunlap. Bookmark the permalink. Wow, Jan. Brilliant job breaking down the various types of speeches we need to be able to give! And great job on all the promotion! Hope it’s paying off big time. Thanks for the compliment, Stan. I’ve found having ‘stock’ speeches really comes in handy and saves time and needless anxiety…which I already have enough of when I think about addressing a new group. You’re welcome! I have to confess that I didn’t think to include the link to Toastmasters – that’s the work of our site managers – thanks for including it, gals! Vikki, becoming a published author will open so many new doors to you, and practice really does help when it comes to speaking. Vital info for any author. Thank you! Thank you! I printed out a copy for my file, then ran for my office and closed the door. HA! I can stand at a podium in front of 350 people and manage an event, but the thought of an actual speech makes my knees wobble. 🙂 I’ll work on it…thanks for sharing. Thanks for the great promo tip and it’s great to see you have the support of your local library. I’d sure love to know how you approached them. I’ve been so fortunate to have the support of my local librarians. They are influencers among readers and it is well worth your time and effort to get to know them. Since I’m such a library regular, I knew our librarians long before I became published, and established relationships with them, so when I jumped into the author pool, I shared my progress with them, and they were encouraging and supporting in many ways. Absolutely! Humor is my stock in trade with my mystery series, and I keep it foremost in mind whenever I speak to an audience. No matter what the topic I’m addressing, I remind myself that every listener wants to be entertained, and humor is a key way to do that. This is a keeper. Printed it to keep in my “Platform” folder to read again and again. Thanks! You’re welcome, Connie. I keep notes on each of my speeches in my folder, too, so I know what worked well each time and what didn’t. Jan, you’re books sound interesting. Jan, I gave a speech at our local library which was I thought was supposed to be for five minutes. I was so nervous about it as I had never talked to a large group for that long. When I got there I was told to speak for 45 minutes. I almost fainted but told myself, “You can do this!” I stretched that talk out by adding everything I knew about writing and what inspired me to write in the first place. Luckily I had a few notes handy in my binder which I read before I went on. Still my heart was pounding “Dixie” for the first few minutes. Love this story, Myrna! I can’t tell you how many times I’ve arrived to speak, and found out that the program isn’t the length I’d been previously told – I either have to do an on-the-spot edit to shorten it up, or add in like you did. After a while, you get really good at winging it – and audiences still eat it up! Hurray for your bravery! I hate, hate, hate speaking! But my audience always says they can’t tell I’m nervous. What–you can’t see my sweaty hands and hear my shaking voice? I’m getting marginally better because I’ve had to do it. Hasn’t killed me yet. I love the idea of the different kinds of speeches. Very helpful! Keep at it, Kaye! I’m glad you found my speech types helpful. Great advice, Jan. Especially as I start developing some talks! Thank you.